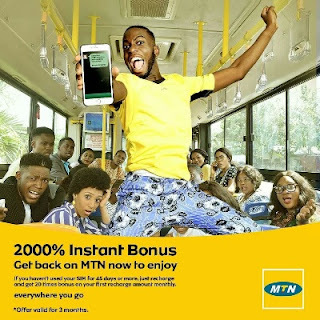 Just like the 9Mobile and Airtel Welcome back offer, MTN has also introduced it's own Welcome Back Bonus offer which gives users a mouth watering 2000% free bonus on calls and SMS to all network as well as Pay-as-You-Go browsing. This is available to all MTN users who haven't used their sim for the last 45days. With the MTN 2000% welcome bonus offer, you will get N2000 worth of airtime when you recharge just N100 on an eligible sim card. Your MTN sim is automatically eligible if you haven't recharged, browse, send SMS or dial/receive calls on it in the last 45days. Below are some are some of the bonus airtime you get when you recharge a certain amount on your eligible MTN sim. Note that 500% of the bonus airtime you receive will be used for SMS and calls to all network at the rate of 80kb/sec (N48/min) while the remaining 1500% bonus will be used for Pay-as-you-go browsing to all network at N5/Mb. Your main airtime won't be deducted until the bonus Airtime is exhausted. Remember that you can only get the free bonus once and you can't use the bonus Airtime to subscribe for a data plan.